CTET Answer Key 2018 Paper 1 Set J – Now, Official CTET Answer Key 2018 has been released by the CBSE. The candidates who appeared in the examination can now check the CTET Answer Key 2018 form the official website i.e. ctet.nic.in. Along with answer key candidates can also download the OMR sheet and raise the objection. For downloading the OMR sheet and checking the answer key, and raising the objection against it if required candidates need to enter the login credentials such as roll number and DOB on the login page. CBSE will announce the Result for CTET 2018 at least 06 weeks after the exam date. Check here all the details CTET Answer Key 2018 Paper 1 Set J. 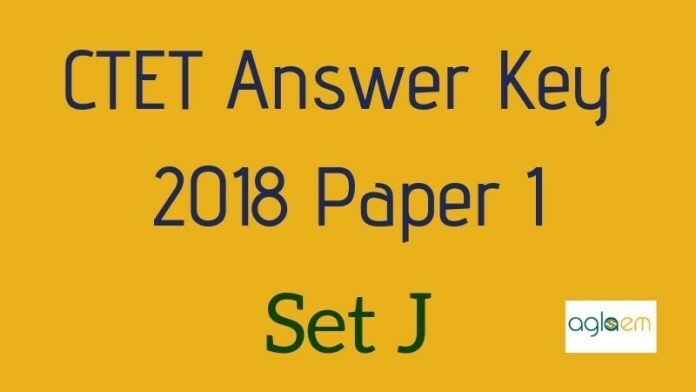 Latest: CTET Paper 1 Answer Key 2018 for Set J has been released. Get it from link below. Official Answer Key along with the OMR Sheet has been released by the CBSE. On the official website, answer key has been made available. By entering asked login credentials on the login page candidates can check and download the answer key and OMR sheet. Click Here to download CTET 2018 Answer Key and OMR. The unofficial CTET answer key for SET J is not as reliable as the official key but it will give an idea about the marks that candidates will score in the exam. The official answer key will contain the correct answer to questions and is expected to be available by December end. How To Download CTET Answer Key 2018 Paper 1 Set J? After the publication of CTET Official Answer Key 2018, the candidates who appeared in the examination will be able to download the answer key. The candidates have to follow the provided steps to download the same. At first click on the above link. Now the link will redirect to the new window, where the candidates may have to enter the roll number/registration number and date of birth to download the same. On providing the details the answer key will open, now download it and calculate your marks. Here the exam pattern of CTET 2018 Paper I is given. The candidates can check the exam pattern from here. How to Calculate Marks Using CTET Answer Key 2018? After downloading the answer key the candidates can calculate their marks with help of marking scheme. As there is no negative marking so it’s quite simple to calculate the marks. For the transparency aspect the examination, the answer key is an important document for the candidate and official body. An answer key is helpful for the candidates to estimate the score before releasing the result. The Board uses the preliminary answer key to take the response of the candidates then it releases the final after considering candidates’ response. CTET Answer key is useful to maintain the transparency in the entire examination schedule. The Board has clearly mentioned in the official notification of CTET 2018, it will release the result within 06 weeks after the date of exam. The final result will be dependent on the final answer key. As the examination is on December 09, 2018, so the result may be declared in the last week of January 2019. Central Board of Secondary Education (CBSE) conducts the Central Teacher Eligibility Test (CTET). The candidates who clear the TET is assigned the Eligibility Certificate. There are two levels in CTET, Primary Level and Upper Primary Level. Those who want to teach the class I to V have to clear the Paper which indicates Primary level, and the Paper II of CTET indicates Upper Primary Level, which is to teach class VI to VIII.